To make a better optical fiber for transmitting laser beams, the first idea that comes to mind is probably not a nice long hydrogen bath. And yet, scientists have known for years that hydrogen can alter the performance of optical fibers, which are often used to transmit or even generate laser light in optical devices. Researchers at the National Institute of Standards and Technology (NIST) have put this hydrogen "cure" to practical use, making optical fibers that transmit stable, high-power ultraviolet laser light for hundreds of hours. NIST scientists expect these hydrogen-treated fibers, described in Optics Express, to reduce errors in logic operations in their quantum computing experiments. Optical fibers generally are not able to transmit ultraviolet light because the short wavelength light can interact with dopants or impurities in the fibers, resulting in so-called "solarization" damage and extreme losses of beam intensity. The fibers effectively shut down. Hydrogen molecules have been shown to heal this damage as it occurs. NIST researchers tested two types of fibers with solid cores made of fused silica surrounded by lattices of air holes, which form a crystal structure that maintains the shape of transmitted laser beams. The fibers were infused with hydrogen gas at 100 times standard atmospheric pressure for four to six days. Conveniently, some of the fibers could be treated in NIST's hydrogen pipeline materials testing facility. 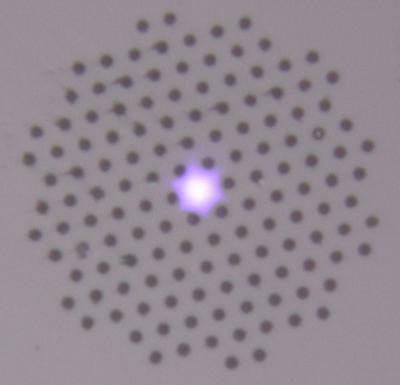 After the hydrogen diffused into the fiber cores, the fibers were cured by exposure to ultraviolet laser light for several days. NIST researchers then tested the fibers by transmitting ultraviolet laser light through them. The fibers did not display any solarization damage, even at output powers as high as 125 milliwatts (mW) at 313 nanometer (nm) laser wavelengths -- several times the beam intensity needed for the group's quantum computing experiments. The combination of hydrogen infusion and curing with ultraviolet light "appears to confer long-term resistance" to this type of damage, according to the paper. The fibers also lose very little of the laser light as it is transmitted. For comparison, NIST researchers also tested fibers that were not treated with hydrogen. With 313 nm wavelength laser light at 100 mW power, light transmission through the fibers dropped to zero in four hours, confirming the value of the hydrogen treatment. The treated fibers could be used to transmit a wide range of infrared, visible and ultraviolet wavelengths of light, according to the research team. When used at NIST to transmit laser light to trap ions (electrically charged atoms), the fibers reduce stray light and fluctuations in laser beam pointing and make it possible to transfer ultraviolet light between separate optical tables, the paper notes. The fibers also can help "clean up" misshapen beams, the researchers say. The same NIST research group has achieved many "firsts" using trapped ions to demonstrate building blocks for quantum computers, which would use the exotic properties of the quantum world to solve problems considered intractable today.